Compulab has announced its first passively-cooled gaming desktop computer developed using the company’s expertise in fanless SFF systems. The Airtop2 Inferno uses an enhanced version of the Compulab’s proprietary natural air-flow (NAF) cooling system that can handle Intel’s Core i7-7700K processor as well as NVIDIA’s GeForce GTX 1080 graphics card. The Airtop2 Inferno will only be mass-produced if the company sees interest from the end user towards such systems. Miniature gaming computers are certainly a part of an ongoing trend towards miniaturization of PCs in general — numerous manufacturers offer SFF gaming systems. Passively-cooled gaming PCs represent another category. Numerous companies have attempted to build such systems and/or produce appropriate components (e.g., Calyos, Zalman, etc. ), but they were either very expensive, large, or had compromises when it comes to performance. Enter, Compulab. 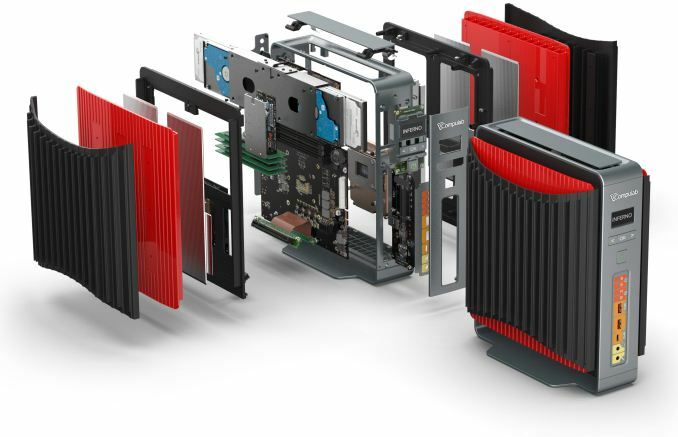 The company has been producing fanless special-purpose SFF PCs since 2007 and has experience with passive cooling. Compulab has been selling its specialized Airtop-branded fanless workstations for over two years now and this month it announces plans to expand its business to gaming systems. The first of such machines will be the Airtop2 Inferno that builds upon the workstation introduced earlier this month, but has an improved cooling system that can handle higher TDPs. The Compulab Airtop2 Inferno relies on a specially-designed Intel C236-based motherboard and will be equipped with Intel’s Core i7-7700K processor as well as NVIDIA’s GeForce GTX 1080 graphics card. The system can be outfitted with up to 64 GB of DDR4-2400 memory, two M.2 NVMe SSDs and four 2.5”/9.5mm SATA storage devices. 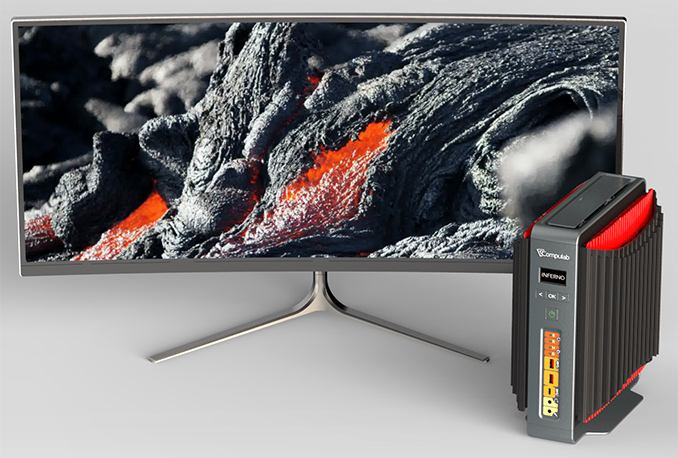 When it comes to I/O capabilities, the Airtop Inferno2 will have two USB 3.1 Gen 2 (USB-A and USB-C) ports (enabled by a FACE module), seven USB 3.0 headers, two GbE controllers, optional 802.11ac Wi-Fi, Bluetooth, audio connectors, DisplayPort 1.2 as well as HDMI outputs and so on. 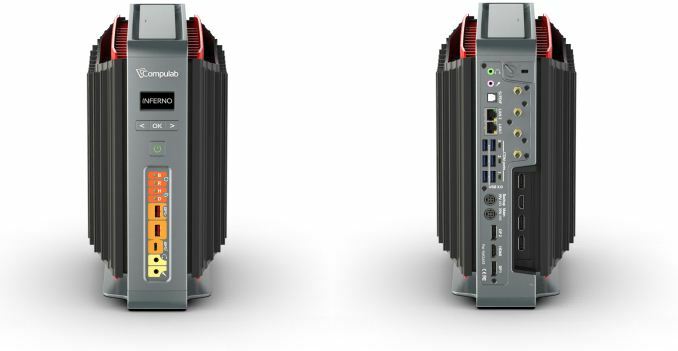 Since the Airtop2 Inferno relies on the Airtop2, it has almost the same connectivity capabilities as the fanless workstation, so it supports an optional 4G/LTE modem as well as FACE expansion modules. The key difference between the Airtop2 and the Airtop2 Inferno is the enhanced natural air-flow (NAF) cooling technology capable of removing up to 300 W of heat. As discussed two years ago, the NAF heat-exchange system uses two special side-panels, each of which can dissipate heat. The side-panels are equipped with traditional flat copper heat-pipe arrays (with micro-channels) that take away heat from the hottest components (i.e., the CPU and the GPU) and spread it across the side-panel. The heat from the heat-pipe arrays is removed by the special air-tube panels consisting of 14 tubes with air inside. Once the air gets hot, it starts to rise up, removing heat from the side panels. The Airtop2 Inferno has side panels that feature additional aluminum tubes/heat spreaders that can dissipate more heat than the regular NAF panels and therefore handle TDP of Intel’s Core i7-7700K as well as NVIDIA’s GeForce GTX 1080. Compulab believes that the maximum TDP rating that the NAF Inferno cooling system can handle is 300 W, enough to keep the aforementioned CPU and GPU cool, but without overclocking. 5.9" × 11.8" × 10"
Compulab describes its Inferno as the Airtop2 on steroids. It is very similar, but uses a different processor, graphics card, cooling system, PSU and is equipped with a module that enables USB 3.1 Gen 2 connectivity. The company has finished development of the system, but needs to fabricate the extra passive cooling elements, for which it plans to run a special crowdfunding campaign. With all things go, Compulab intends to ship the system in June. The actual price of the Airtop2 Inferno will depend on exact configurations of RAM and storage, but expect starting price to be comparable with pricing of beefed-up Airtop2 workstation. Compulab expects to start selling the Airtop2 Inferno direct from its website in a couple of months. That does seem a bit odd, though, given that their current Airtop2, which features a smaller cooling unit, handles an i7 7700 just fine. It doesn't appear that the GPU and CPU cooling assemblies share any thermal load. That's a very appealing system and impressive at offering such cooling capability passively. I'm not crazy about the looks. On the workstation version a lot of people seemed to like them a lot, although it seems more people just wanting to complain about the excessive RGB lighting that is permeating so many computer products. Its not even that it looks bad to me, but feel like a simple more unified design would look a bit better (the black fin pieces over top of the red ones for instance. Maybe some other color options. I'd also kinda like an actively cooled version, with fan(s) integrated into the base (maybe a single large one, or maybe 3 120mm fans, well integrated so they wouldn't be visible, and would be nearly inaudible. It'd give just a bit more headroom.